30 Jan 19 — A brand new training programme run between Parogon Group and Stoke-on-Trent College has been a huge success with three students earning jobs as Commis Chefs at The Orage Tree and The Wayfarer. PICTURED: From left: Katy Chesters, Business Development Associate for Stoke-on-Trent College, Jack Wall, (18) from Blythe Bridge, Wiktor Pocalun, (19) from Bentilee, Kyle Johnson-Cooper, (17) from Madeley and Ben Allison, Operations Support Manager at Parogon Group. A brand new training programme run between Parogon Group and Stoke-on-Trent College has been a huge success with three students earning a job. Parogon and Stoke-on-Trent College have developed a partnership to offer a work experience program to trainee chefs. The program lasted for 12 weeks and involved learning the skills and practicality required for a future career working as a chef in one of the group’s fine dining venues. in kitchens. The three students that were selected for this process; Jack Wall, (17), Wiktor Pocalun, (18), and Kyle Johnson-Cooper, (17), have all been offered jobs due to their impressive performance. The new Parogon Commis Chefs had to go through a stringent recruitment process to be accepted on to the work experience placement before being selected. 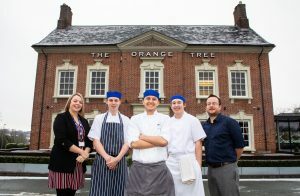 Jack is now a part-time Commis Chef at The Wayfarer and Wiktor and Kyle are the latest part-time recruits at the Orange Tree. Whilst studying the Level 2 Professional Cookery qualification, they were given the opportunity to apply. They initially undertook an eight-week trial period and impressed so much that this was extended to 12 weeks where they were given the job. Katy Chesters, Business Development Associate at Stoke on Trent College, commented: “Parogon Group is one of the fastest growing employers in the hospitality sector in Staffordshire, with an outstanding reputation for high quality food and service. The program had been worked on over 12 months between Parogon and Stoke-on-Trent College to develop a strong and efficient structure that would ensure the students learned as much as possible. They were given roles and stations each week from kitchen porter, to food prep, then to expediting, station shadowing and then being able to work on a station.